“Operation Clean Sweep” An anti-blight initiative a success. Mayor Jim Fouts of Warren, Michigan, Michigan’s third-largest city, implemented a program to improve Warren’s older neighborhoods, where blight had lowered property values and led many residents to move. We initiated a well-organized program of intensive house-to-house and business-to-business inspections and cleanup in older neighborhoods. We established a task force of representatives from city departments, including police, public service, building, property maintenance, sanitation and communications. 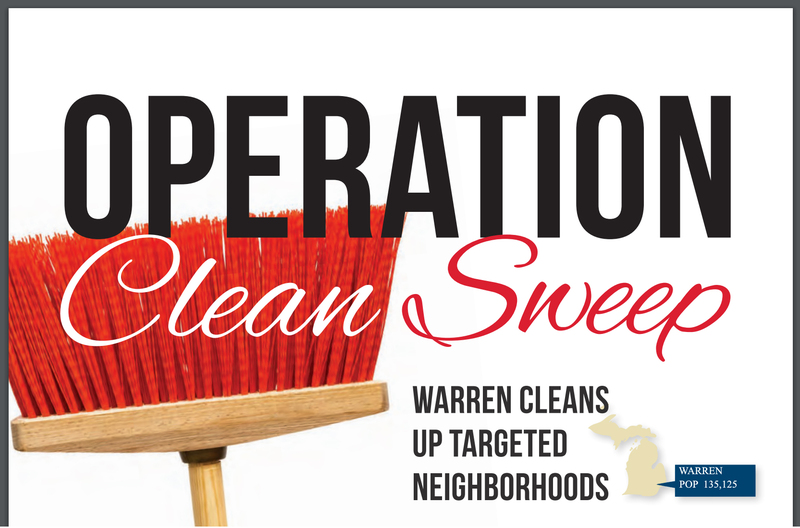 Task force members recommended “Operation: Clean Sweep,” a neighborhood-by-neighborhood, street-by-street, house-by-house, weeklong sweep of targeted neighborhoods. A special brochure was prepared to warn citizens that clean sweep was coming to their neighborhoods. Mailed to every address in the area – addresses came from the city’s assessing department – the brochure told residents and businesses that the community police and city inspectors were on their way. The brochure was mailed one week before the sweep to give residents an opportunity to clean their properties. Accumulation of waste, debris, and rubbish. Storage of metals, wood, vehicle parts, tires, discarded household items, etc. Residences that housed businesses and equipment storage. Illegal signs, fences and sheds. Residences with evidence of rodents. Houses and garages in need of repair. Vacant buildings that are neighborhood eyesores. Improper storage of rubbish containers. Residents of the City of Warren were also warned that a new city ordinance lowering the maximum grass growth from nine inches to six inches would be enforced. Residents were also requested to move their vehicles from the streets to allow the city’s public works street sweepers to do their jobs. Sanitation department employees picked up such discarded items as appliances, furniture, tires, and carpeting on their usual rubbish pickup day. For cable TV viewers, city communications department staff broadcast a series of public service announcements about the sweep schedule. Follow-up inspections showed 95 percent compliance. Violators were ticketed and scheduled to appear in court to explain why their properties were not cleaned. Vacant buildings were “posted,” requiring city certification before they could be occupied. An interesting sidelight was an increase in the number of building permits. The building department monthly report showed a dramatic increase in revenues compared with the same month the previous year. This was directly attributable to owners of the posted houses applying for permits to bring their properties up to building code. The almost complete disappearance of junk and inoperable vehicles from the neighborhood was remarkable. Police ticketed vehicles that were inoperable or had expired license plates. Follow-up by the police showed the majority of inoperable vehicles were moved. Rubbish-container violations were issued, ranging from containers lacking lids to containers placed illegally. Vacant buildings had to be boarded for health or safety reasons by crews at the expense of the owners. Illegal sheds, fences, and signs were also cited by zoning inspectors, and businesses run out of houses also received violations. A surprising statistic, however, was the number of vacant, dilapidated buildings, including garages, that were cited for possible demolition under the city’s nuisance abatement program. These buildings were cited as “unfit for human habitation.” Demolition costs are the responsibility of the owners of the building. Operation: Clean Sweep made a difference. City departments shared the same goal and their roles were clear and didn’t overlap. Residents of older neighborhoods appreciated knowing that their governing officials care. Building community pride takes time and effort, and making the effort to have cleaner neighborhoods is a major factor in building pride.